The families of victims of one of Northern Ireland's worst terrorist atrocities may be set to see an edited version of a long-awaited report into the killings, the High Court has heard. 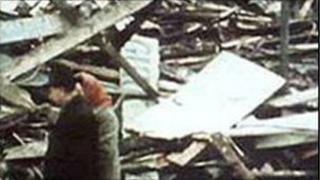 Fifteen people were murdered when McGurk's Bar was blown up by loyalist paramilitaries in December 1971. A Historical Enquiries Team (HET) review of the police investigation into the bombing has been completed. An edited version of the report could be released soon. Lawyers for Chief Constable Matt Baggott have been granted a two-week adjournment to carry out further work on the possible release in redacted form of the dossier on the massacre. But with detectives said to be pursuing further evidential leads, the findings remain withheld from relatives of those killed in the Ulster Volunteer Force (UVF) attack on the north Belfast pub. Judicial review proceedings have been issued against the chief constable, claiming he is under a public law duty to disclose the report without delay. The legal challenge, brought by Bridget Irvine, whose mother Kitty was among those killed, contends that the ongoing failure to hand the dossier over is irrational, unlawful and in breach of their human rights. In court on Tuesday her barrister confirmed lawyers for the PSNI (Police Service of Northern Ireland) were seeking more time to consider whether to release a redacted version. The barrister said the families were prepared to "acquiesce" to a short adjournment but would not consent to a suggested four-week period. "I would ask the court to keep a very short leash on the work of the chief constable," he said. "Frankly we are now approaching the 42nd anniversary and my clients, most of them are very elderly. "They just want some finality to this stage of the process before they move on to the next stage of the process." A lawyer for the chief constable told the court work would continue in the next two weeks. "The PSNI have been making progress in respect of this point, but just aren't quite at a position yet to bring it to fruition," he said. Just one man has been convicted for his part in the attack. The legal challenge follows a Police Ombudsman probe in 2011 that claimed the original RUC investigation was biased. It said police failed to properly investigate loyalist responsibility for the bombing because they were so focused on the idea that the IRA was to blame. At the time, Mr Baggott pointed to different conclusions reached by other reports. The High Court case will be heard again on 19 November.